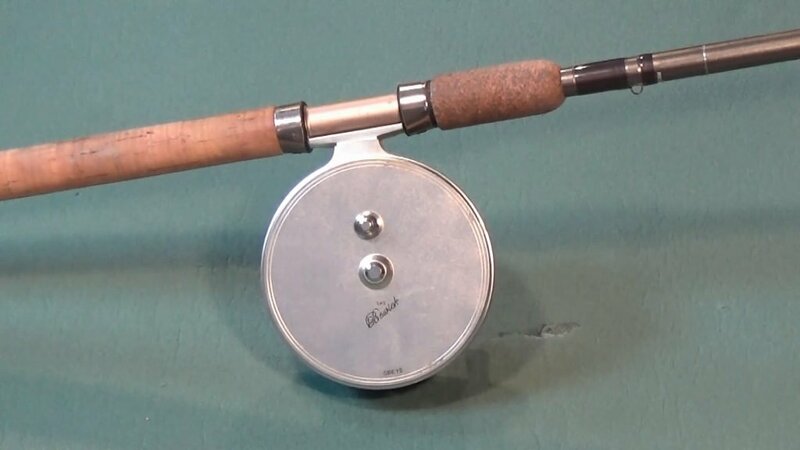 Centrepin reels – There are two types of centrepin reel commonly available, the traditional true pins and centrepins with bearings. The spool of the true pin rotates directly on the pin. There is a grub screw in the hub to adjust the end float of the spool. Whereas centrepins that boast ball bearings have frictionless ball racers, or something similar, inside the spool. The two types of centrepin do behave slightly differently. True pin reels rotate most freely when the reel is held horizontal. This is because the spool is only resting on the grub screw touching the end of the pin, which offers little resistance. With the reel held vertical the spool is resting on the length of the pin, which offers slightly more resistance to the spools rotation. The exact opposite happens with the bearing type reel. The bearings are most efficient with the reel in the vertical position. The spools of bearing reels are often, but not always, heavier requiring slightly more force to overcome the inertia of the spool. But once going they are slower to stop which will increase the chance of an over run. There may be reels with different types of bearing that behave differently. I can only report what I have seen. Does any of this matter? The differences in performance I have just mentioned are minimal. Either reel is ultimately controlled by your thumb against the edge of the spool. Although knowing the characteristics of your reel may help in their use. 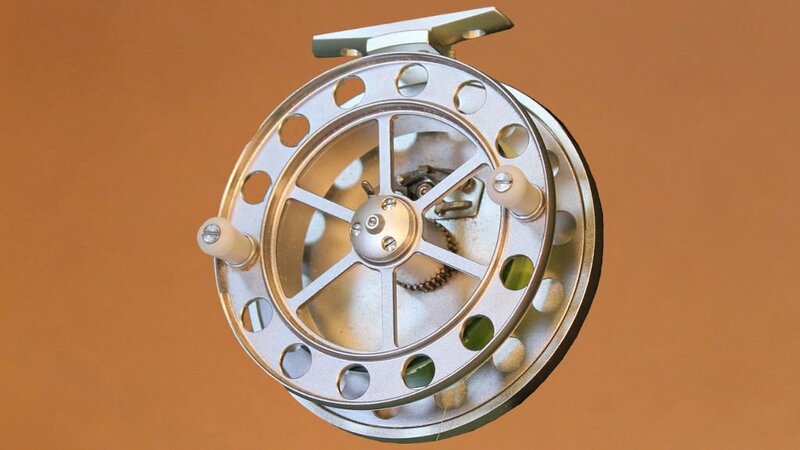 A centrepin should spin freely, although some reels are fitted with an adjustable drag. This is not a drag used to play a fish against, it is there to slightly reduce the free running of the spool, or perhaps I should say to slow the run away spinning of a spool. Other features are a ratchet or clicker. The ratchet is not an anti reverse, the spool will still rotate in either direction with the ratchet engaged, but it does stop the spool rotating unexpectedly. Most ratchets make quite a noise which can disturb other anglers. I use the ratchet for transportation of the reel and very sparingly when fishing. Some reels have a line guide which helps to prevent tangles and line wrapping around the reels foot. Centrepins are easier to use without a line guide and in time you may find you don’t need one. 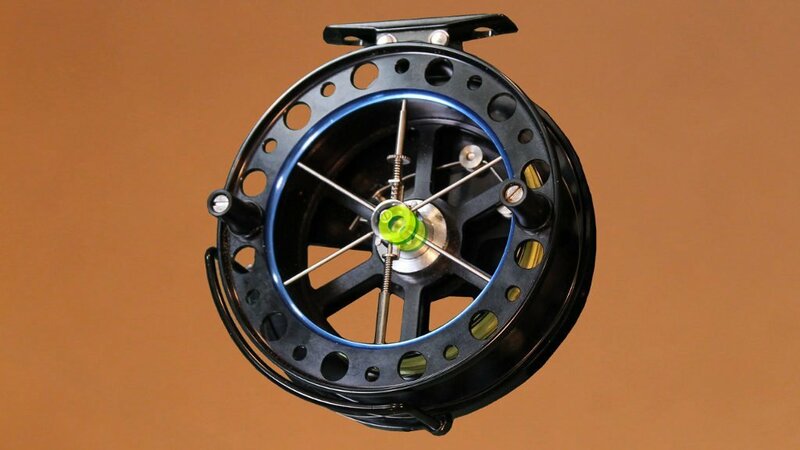 The reel size is often, but not always, described by the outer diameter of the spool. A 4½ inch reel with a 1 inch wide spool is in my view a good general purpose reel. Fixed spool reels often come with spare spools, allowing the angler to change the line at any time. Spare spools are rarely included with a centrepin and can be difficult to find. I believe this is because there is little call for them. Most anglers use a centrepin for only one task and so use the same line for that task. If I want to change the line I will wind the old line back onto an empty line spool and load new line onto the reel. To attach the line to the spool, lasso the spool with a uni knot or a grinner knot or my favourite an arbour knot. I like to cover the knot with some electrical tape or masking tape to stop the line slipping on the drum. It also stops the the subsequent layers of line catching on the knot. I only put 50 to 70 yards of line on a centrepin. It is enough for the small rivers I fish. More importantly the upper layers of line are less likely to bed in causing problems when long trotting or casting. Heavy line or a line designed to sink like feeder line, is best avoided if the reel is to be used for trotting a float. I find 3 to 4lb monofilament is good general purpose line for trotting. The question of whether to have the line coming of the top or bottom of the reel is a personal one. There are various opinions as to which one is better, but I always take the line off the bottom. It just feels more natural to me when winding in and controlling a fish, but in the end it is entirely your choice. As for maintenance of a centrepin, keep the reel clean and from time to time add a drop of light machine oil to the pin. Bearings are often sealed for life and don’t need any oil, but please consult the reels documentation. 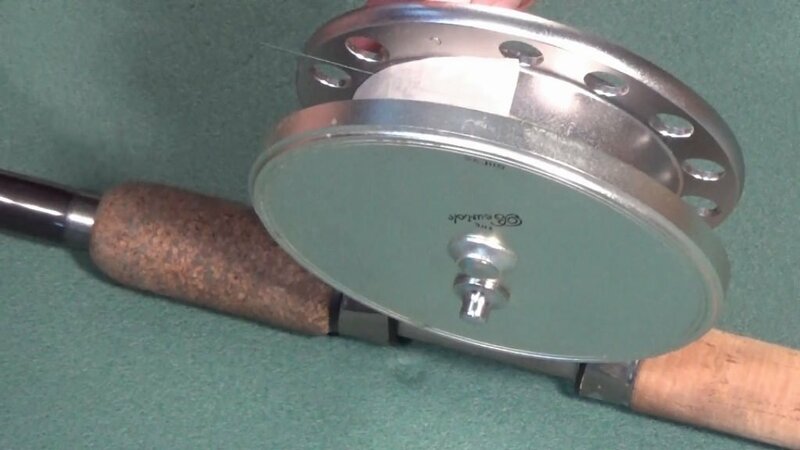 On either type of reel, the spool can be removed by releasing a catch and lifting the spool off. I do not use light oils in spray cans or easing oils on my reels. 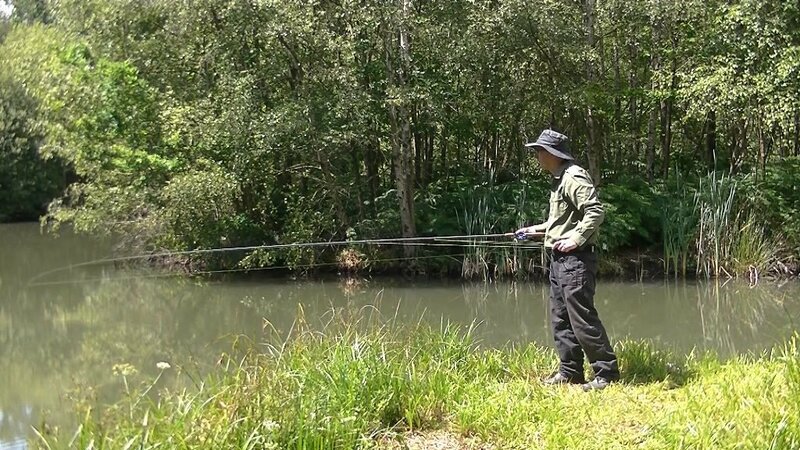 Casting further than twenty yards is more suited to the fixed spool reel. Fortunately most of the time I only need to cast a short distance, or fish off the rod tip and allow the current to take the float. The easiest cast and the one frequently used is the loop cast. To perform the loop cast, pull off some line between the reel and the first rod eye. Then simply swing out the rig and let go of the loop. To cast a little further, pull line from between both the reel and first eye, and the first and second eye. Swing out the rig letting go of the first loop and then the second as the rig goes out. I prefer to hold the last shot on the line in my free hand. Allowing me to load the rod and have better control of the cast. Most of the time a loop cast is quite sufficient on small rivers and I suspect for most of us this is the case. But I will also describe the Wallis cast, as I understand it. The principal of the Wallis cast is simple enough. Lob the tackle out and spin the reel at the same time. 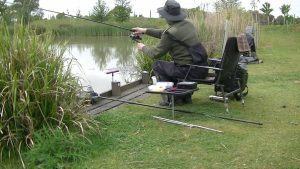 A great deal of practise is required to be able to cast, for example, a 3AAA float more than 10 yards. Being in control of the reel is important in the Wallis cast. Hold the reel in such a way to allow a finger or thumb to be able to touch the rim of the spool. I hold the rod in front of the reel gripping the rod between thumb and fingers, using my little finger to control the spool. Others I know prefer to control the reel with their thumbs, holding the rod above the reel. 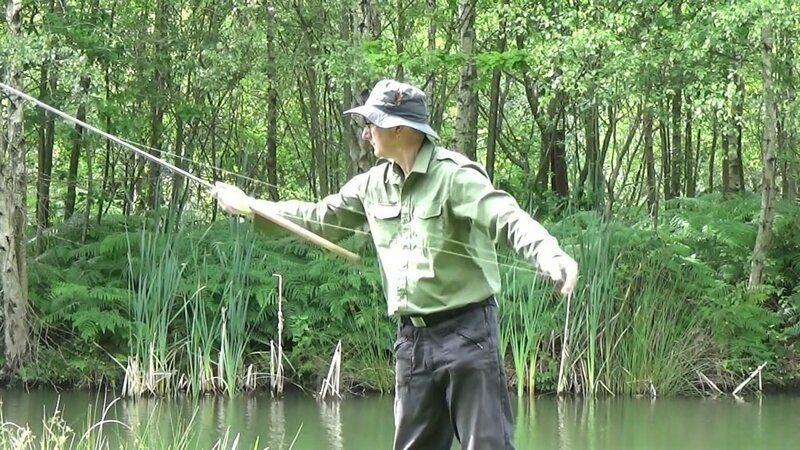 Hold the end tackle by the last split shot or the weight in your free hand. 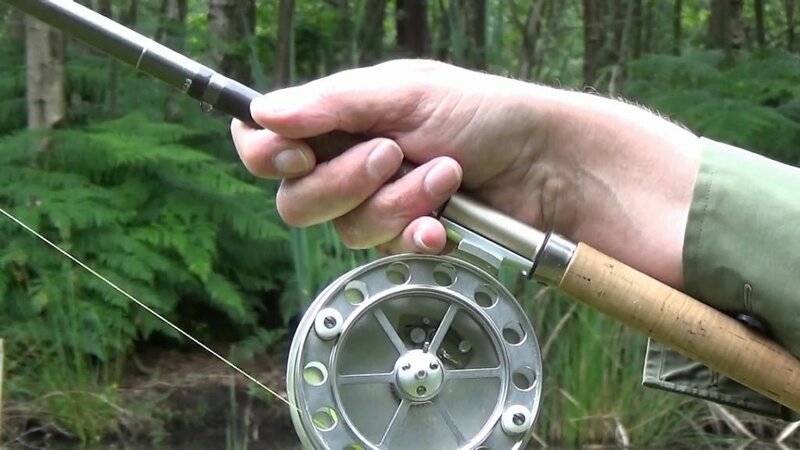 Use your thumb to pull off 12 to 18 inches of line from the reel at right angles to the reel. Do not grip the line just hook your thumb over it. Press the little finger of your rod hand against the spool to lock it. Put a slight bend into the rod. Pre-loading the rod is an important part of the Wallis cast, it helps to fling the tackle out. Under loading the rod will make the cast less efficient. Overloading can cause the tackle to jerk potentially ruining the cast. Start the cast by rotating your body towards the target, but without changing the relative position of your hands or letting go of the end tackle. Just rotate a few degrees to get the cast started smoothly. Release the end tackle which will immediately start to move pulled by the already loaded rod. Continuing the cast with your rod hand, at the same time pull back on the line hooked under your thumb and lift your little finger off of the spool. It feels like you are throwing your arms wide apart. As you open your arms one side of the loop hooked under your thumb will pull line off the reel. The other side of the loop will pull on the line from the end tackle. This will shorten the line between rod tip and tackle. 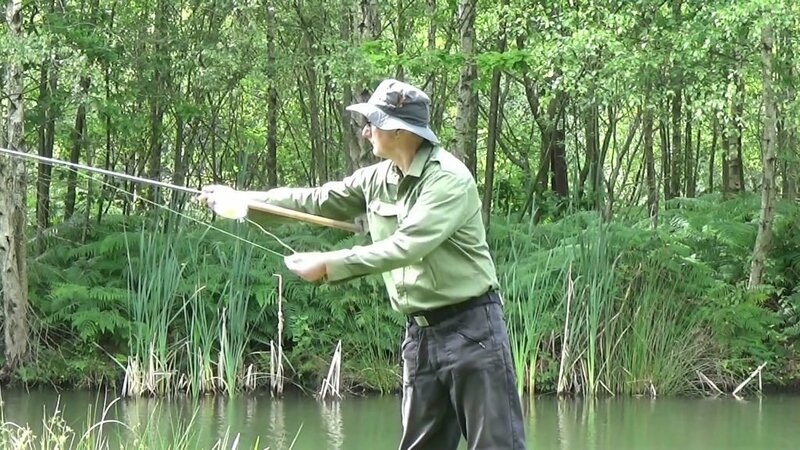 The end tackle will accelerate being pulled by the rod and your free hand pulling the end tackle towards the target. It is important to understand that accelerating the end tackle by pulling back with your free hand plays a big part in getting any distance in the cast. It is this action I feel should be your main thought when practising the Wallis. Return you free hand back to the rod along the same path allowing the line to run through your fingers as it goes. Do not let go of the line at any time as it will almost certainly wrap itself around the reel. The end tackle will naturally slow as it runs out of energy and drop towards the water. The reel will still be spinning quickly, touch the spool with your little finger to slow the spool to match the end tackle. As soon as the tackle splashes down, stop the spool completely. It may just be me, but I find I cannot cast as far with a ball bearing reel as I can with a true pin. I can only imagine this is because the ball bearing reels have heavier spools that take a fraction more effort to spin up, effort which goes into the cast with a true pin. Casting from the side requires room on the bank. In a tight swim the cast can be adapted to an under arm cast. Under arm cast as you would with a fixed spool reel, just add the pulling on the line to spin the reel as with the side cast. An under arm cast also works well from a high bank. At the end of each cast glance down at the reel to make sure there are no tangles, always chuck ‘n’ check. Do you need to learn the Wallis cast to use a centrepin, defiantly not. I would hate to think of anyone being put off of the centrepin just because of the Wallis cast. The Wallis allows you cast a little further than the loop casts, but I find nine times out of ten I don’t need to cast more than a rod length or two to trot a float down a river, for which the loop cast is sufficient. To quickly reel in you can of course use the handles, but a quicker way is to bat the reel. Simply swipe the spool and spin it up to retrieve the line. Reels that don’t have a line guide are easier to bat. 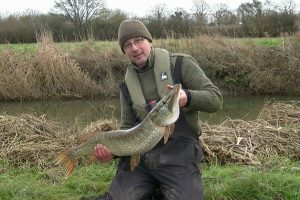 Centrepins are most suited to is the control of a float trotting down a river. The speed of a float can be controlled by hand or with the reels drag. 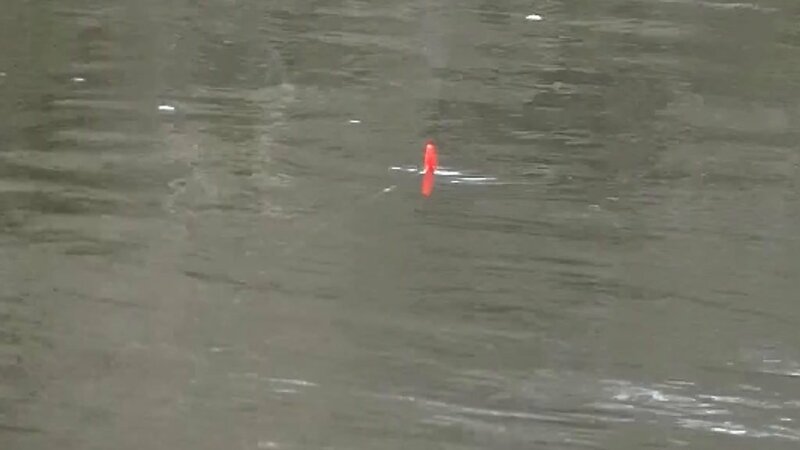 The drag can be adjusted to let line out at a steady pace, which is fine on a stretch of river with a constant steady flow. The second option is to control the speed of the float by hand. This is usually done by holding the rod in a way that allows you to touch the rim of the spool with a finger or your thumb. 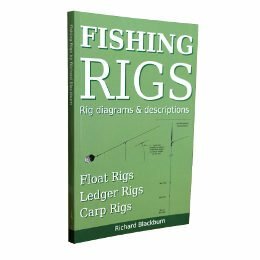 In a strong flow when using a heavy float, the float and line will be swept downstream pulling line off the reel. In fact you may need to slow the release of line with your thumb against the spool. Slow moving waters, or in the summer when a river is at it’s lowest, there may not be enough force on the float to pull line off the spool. In these conditions you can control the progress of the float by turning the spool by hand. Lightly flick the spool or rotate the spool with a finger to control the pace of the float. And then there are the times when a river is more like a still water and no effort is needed. This is one advantage of the centrepin, no matter what the conditions, the angler has control of the float. 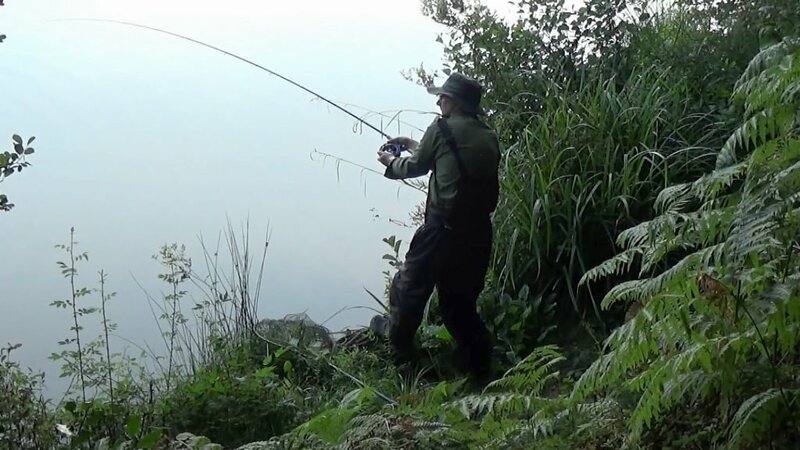 To strike at a bite is just a matter of locking the reel with your thumb and striking in the usual manner. 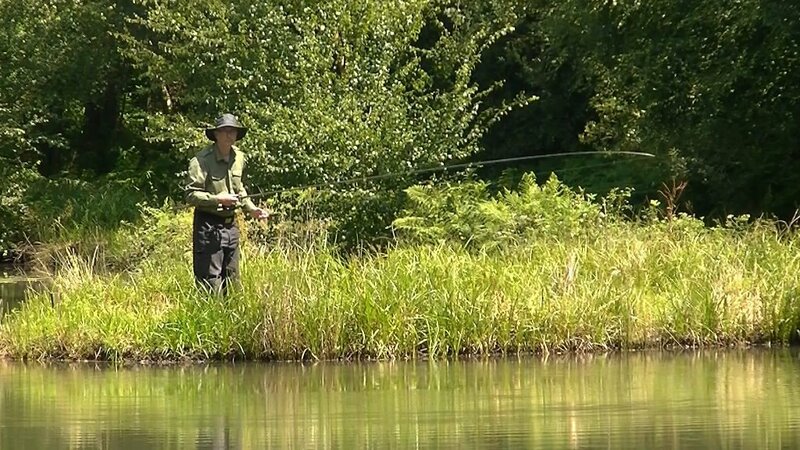 One advantage when fishing in running water, is that you can strike enough to feel whether you have connected, but if you miss you can just let the float resume it’s way downstream. 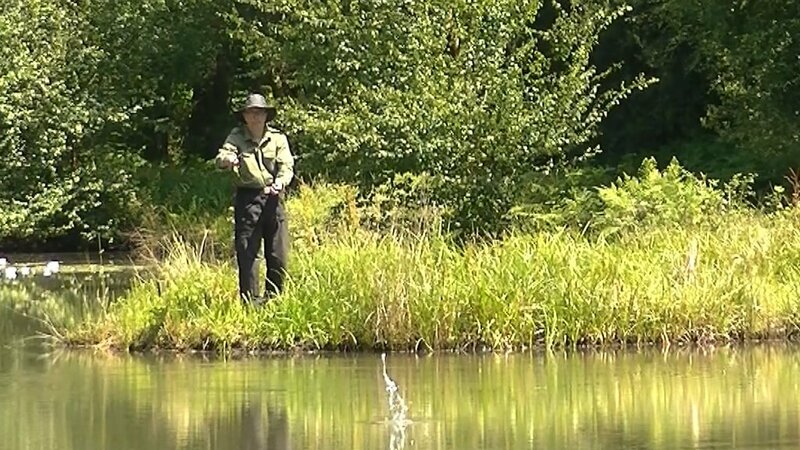 Playing a fish without breaking the line or pulling the hook is something you get a feel for. Learning when to give line and when it’s safe to pull against the fish is something that takes practice. 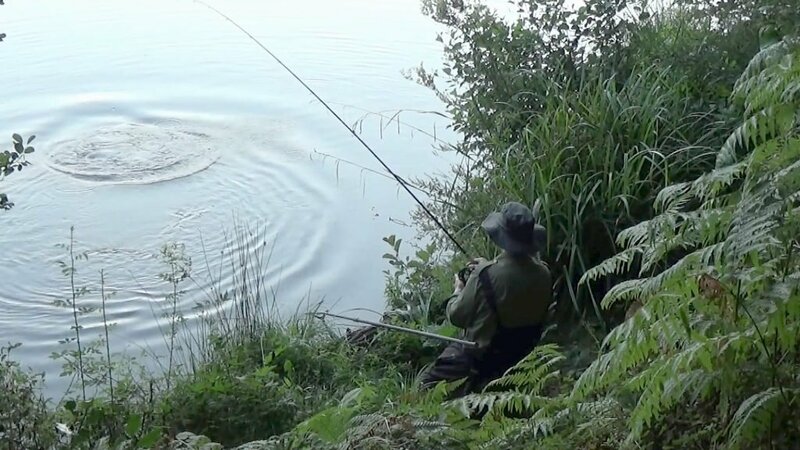 Expect to loose the odd fish until you get to know the limits of your tackle. Apply pressure to the spool with your fingers or thumb to control the fishes run. Or use the palm of your free hand, often called palming, to control the fish. Always keep some pressure on the spool to maintain control. When the fish begins to tire, use the handles to wind the fish in to the net. When playing a fish I find it helps to be conscious of what the rod is doing. You can feel the fish pulling which gives you a good idea of how powerful, or not, the fish is. I just use my peripheral vision to watch the rod keeping my main attention on the fish.